Crostata As its name suggests this dish has its home in Italy and is a very simple way to make a pie without too much fuss – with very little rolling and cutting out of pastry. 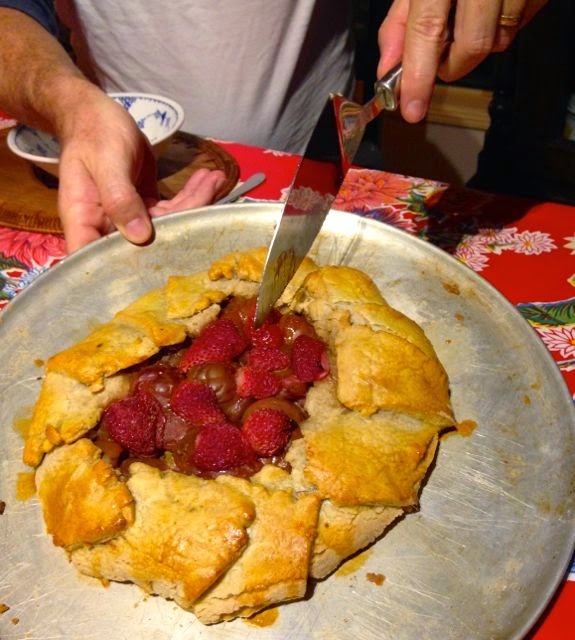 Crostata with plums and strawberries – you can see where the rustic comes from! I first came across this pie in a pastry making demonstration by Belinda Jeffery – food writer and pastry cook extraordinaire – my skills are decidedly lacking so I decided to pay some attention and see if some of hers would rub off on me. Since then, crostatas have regularly been rolled out for the family especially during the stone fruit season – it’s a particularly delightful pie with plums, apricots or rhubarb, but you can make it with apples, pears with any kind of berries added. The fruit sits on a base of crushed nuts and brown sugar – the nutmeal can be almond, pistachio, macadamia or hazelnut – which soaks up any juices from the fruit, stops the pastry from going soggy and adds an extra yumminess to the pie. Belinda makes hers with crushed amoretti biscuits and I have also made it with crushed digestive biscuits when I didn’t have any nuts to hand. 1. To make pastry, put flour, butter, sugar, salt in food processor and whizz together until mixture resembles breadcrumbs. With processor running add egg yolk and keep going until mixture forms into a ball. Depending on size of egg yolks you may also need to add a small amount of iced water. 2. Turn dough out onto floured board and form into a ball, then flatten into a disc and wrap in plastic film. Chill for about 30 minutes in the fridge. 3. Preheat oven to 200oC. Lightly grease a pizza tray. 4. Mix together nutmeal, brown sugar and cinnamon and set aside. 5. Remove pastry from fridge and roll out on pizza tray. It doesn’t have to be a perfect round. Roll right to the edge. 6. 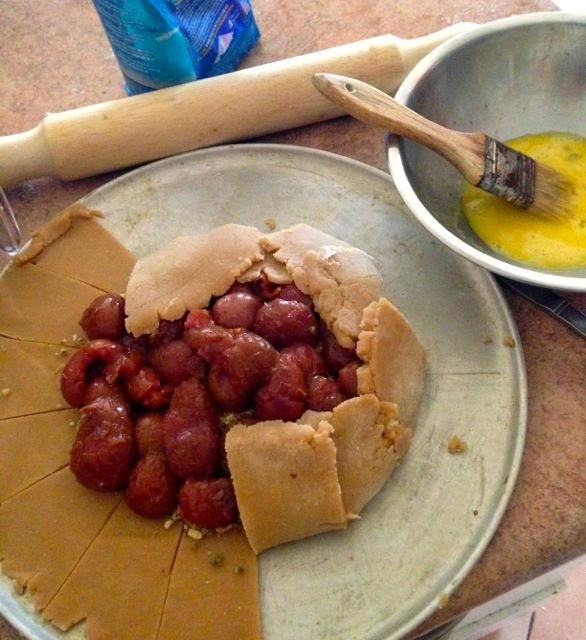 Place the nut/sugar mixture in the middle spreading it into a circle. Place the fruit on top. 7. Now you have to imagine that you are a child and drawing a picture of the sun with a knife from the fruit out to the edge of the pastry. Carefully flop it over the fruit in a random fashion – it should only have cover the fruit leaving the centre exposed. Sprinkle extra sugar over the top of the fruit if needed. NOTE: It’s important not to break the strips or make holes in the pastry otherwise all the fruit juices will seep out. 8. Lightly beat the egg white and brush over the pastry – this will give it a golden colour. Place in oven and bake for 35-45 minutes – should be lightly golden. Serve with cream or ice cream.